Marte Borgmann, Garfield HS: "The Power of Diversity"
As I walk down the halls of Garfield High School and look at our muraled walls, I see the painted faces of former Bulldogs looking out at me. Garfield has a long and storied legacy which is depicted in these colorful images which run along our first floor corridors. From the portrait of Fun Fest, an old annual festival that showcased different students and their cultures, to the commemoration of the members of Garfield who were sent to Japanese Internment Camps during the early 1940’s, the murals tell the stories of students who thrived and struggled throughout our high school history. 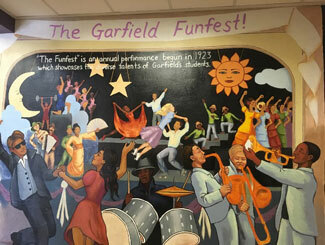 The pictures and words illustrated upon our walls, educate us on how the Garfield community has been important to each other’s success and that when injustice occurs, Garfield has stepped up and fought back. This legacy continues throughout today, and being a part of a student body that is not afraid to stand up and take action against injustice, has been an empowering part of my education. During the fall of my sophomore year the 2016 presidential election occurred, causing unrest and a wide array of emotions within the student body and staff. It prompted many heavy conversations in my classes where I heard students feeling empowered to let their voices be heard. 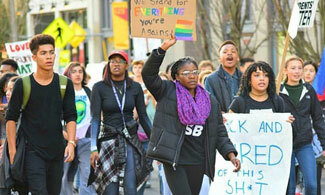 So with my student body officers, we coordinated with the schools in our area and organized a march for equal rights. On the morning of the march, I remember that the hallways were buzzing with anticipation, as hundreds of students carried larger posters that spoke sayings like “The People United Will Never Be Divided” and “Build Bridges Not Walls”. Marching through Seattle’s cities streets with thousands of students around me, I felt empowered and that my voice as a student counted. I was a part of a community where every person regardless of race, gender, class, or sexual orientation mattered. That day was a turning point for me in that I saw thousands of students set aside their differences to join arms in speaking out. 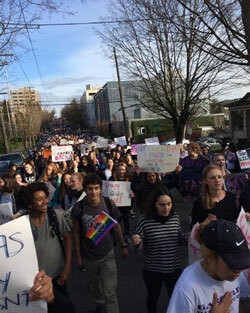 During my next couple years, Garfield students have rallied our peers to form walkouts in support of teachers rights, in commemoration of those lost in school shootings, and in alliance with those fighting the oppression in the Philippines. In each of these instances I was blown away with the sheer numbers of students who took time out of their education to stand in solidarity with other Bulldogs. Going to a large urban high school like Garfield, there is an enormous amount of division within our school. We would like to say that we are “One Garfield”, however most often that feels untrue. Friend groups divide by race and class because students feel drawn to those who are similar to themselves. Bridging those divides within Garfield can feel like an insurmountable task and one that feels overwhelming. However, our different backgrounds and cultures, I believe, are what make us able to learn from each other about the issues students face and are passionate about. I have seen how open minded many students are about starting the well needed conversations on Black Lives Matter, gentrification, and other issues that our whole country and world face every day. Now as a senior, I look back on my four years at Garfield and am truly grateful for all that I have learned from my peers and for all the opportunities I was given to share my voice and give space to hear the voices of my fellow classmates. I have learned how valuable it is to create space within schools and communities encouraging us to hear everyone’s stories and keep those hard conversations going, however challenging it is. 3/25/2019 Marte Borgmann, Garfield HS: "The Power of Diversity"
3/5/2019 Anson Huang, Renton HS: "Life as a Running Start Student"